After dinner, a man in Hong Kong began charging his Samsung Galaxy S4 so he could play a smartphone game. Then, the man says, the smartphone caused his home to catch fire. According to reports on website IT's House (via UPI), the smartphone's owner, a 47 year-old man surnamed "Du," was on his sofa playing a game called Love Machine on his still-charging phone. He apparently heard a loud noise and dropped the phone on the sofa. The Galaxy, allegedly, was on fire, and the flames spread throughout the house and even to the man's Mercedes. The fire department's report stated that there were "no suspicious circumstances, [but whether] the true cause of an entire house fire was actually the smartphone remains to be seen." According to UPI, China's national news agency, Mr. Du said his Galaxy S4, the phone's battery, and the phone's charger were all official Samsung products. 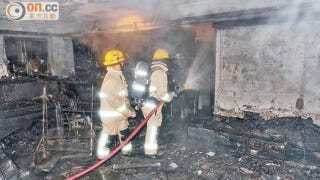 However, officials stated it would be difficult to confirm these claims due to the damage caused by the fire. Samsung, however, told IT's House (via UPI) that it will move forward with "detailed investigations and tests" to determine what caused this incident.